Chateau de Nalys takes its name from the original founders of the estate who owned the property in the 1700’s. The domaine was confiscated during the French Revolution, broken into smaller parcels and sold at auction. In the modern era, Domaine de Nalys came to be known for producing quality wine under the direction of the Dufays family, when it was owned by Dr. Philippe Dufays. Philippe Dufays improved the domaines wine making practices and increased the size of the de Naly vineyards to almost 80 hectares. Under the direction of Philippe Duffay, Domaine de Nalys became one of the earliest producers in the Southern Rhone Valley to bottle and market their own wine. This began taking place as early as 1955. After the tragic death of his son at a young age, Philippe Dufays split up the vineyards of Domaine de Nalys. In 1976, he sold 50% of the estate to the Groupma Insurance Company and the rest of the vineyards were sold to different growers and winemakers active in the appellation. Domaine de Nalys has from time to time produced private label blends to order, which has hurt the brand in the eyes of some consumers. In 2005 and 2006, the estate made a wine for the giant American retailer, Costco, which was sold under the name of The Kirkland Signature Cuvee de Nalys. In 2005 Les Dix Salmees was made for export to the British market. Things changed again at Domaine de Nalys in July, 2017, when the estate was sold to Domaine Guigal. Isabelle Ogier was retained as the long time, Technical Director. The name of the estate was officially changed from Domaine de Nalys to Chateau de Nalys. Chateau de Nalys has 50 hectares of vines of which 40 hectares are used to make red Chateauneuf du Pape wine and 10 hectares are reserved for making Chateauneuf du Pape Blanc. 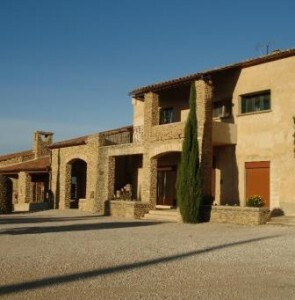 Chateau de Nalys produces 2 red Chateauneuf du Pape wines and 2 Chateauneuf du Pape Blanc wines. Coinciding with the change in ownership to Guigal, the names and blends changed for the red and white wine of de Nalys starting with the 2016 vintage for the red wine, and 2017 for their white wine. All work in the vineyards is 100% organic. Chateau de Nalys Saintes Pierres de Nalys is a blend of 69% Grenache, 20% Syrah, 5% Cinsault, 4% Muscardin, 1% Counoise, 1% Mourvedre, though that can vary, depending on the vintage. The terroir is from the Nalys, Bois Senechal and La Crau lieux-dits. The vines are on average about 45 years of age. The wines are vinified in stainless steel. For the aging, 90% of the wines are aged in stainless steel tanks, and 10% of the production is aged in old foudres. Chateau de Nalys Grand Vin is usually a blend that averages close to 60% Grenache, 30% Syrah, 5% Mourvedre, 4% Counoise and 1% Vacarese. Though it varies depending on the vintage. The vines are planted in 3 different terroirs. You find red sandstone and sandy clay, with some limestone in the Nalys lieu-dit. In the Bois Senechal vineyard you have small rocks, stones and sand. In La Crau, where 50% of the vines are planted, the soils are large stones and rocks. The vies average 45 years of age. The wine is aged for close to 20 months in demi-muids before bottling. Not much wine is made, as the average is only 400 cases per vintage. Chateau de Nalys Saintes Pierres de Nalys Blanc is produced from a blend of 36% Clairette, 29% Bourboulenc, 25% Grenache Blanc, 7% Roussanne, 3% Picardan. The wine is aged in 80% stainless steel, 20% in wood for 8 months. Chateau de Nalys Grand Vin is a blend of 43% Roussanne, 33% Grenache Blanc, 15% Clairette, 6% Bourboulenc and 3% Piquepoul. The vines are close to 50 years of age. The wine is vinified and aged for 8 months using 70% wood barrels and 30% stainless steel. The following 3 red wines and one white wine are no longer being produced: Domaine de Nalys Chateauneuf du Pape, Reserve, Cuvee Chataignier and de Nalys Chateauneuf du Pape Blanc. Chateau de Nalys can be enjoyed on the young side. Young vintages can be popped and poured, or decanted for about 1 hour, give or take. This allows the wine to soften and open its perfume. Older vintages might need very little decanting, just enough to remove the sediment. Chateau de Nalys is usually better with 2-4 years of bottle age. Of course that can vary slightly, depending on the vintage. In the best vintages the wine should be consumed within 4-14 years after the vintage. Chateau de Nalys is best served at 15.5 degrees Celsius, 60 degrees Fahrenheit. The cool, almost cellar temperature gives the wine more freshness and lift. Chateau de Nalys is best served with all types of classic meat dishes, veal, pork, beef, lamb, duck, game, roast chicken, roasted, braised, stewed dishes, sausage, barbecue, grilled meats and cassoulet. Chateau de Nalys is also good with Asian dishes, hearty fish courses like tuna, mushrooms, cheese, pasta, eggplant and tomatoes. The white wine of Chateau de Nalys is best served with a myriad of different seafood dishes, shellfish, crab, lobster, sushi, sashimi, chicken, pork and veal, as well as Asian cuisine. Rich, with layers of smoke filled, ripe, sweet, polished, fresh red fruits. Cherries and plums are all over the place, with peppery, mineral driven accents. The wine is quite full bodied, due to the nature of it being dominated by Syrah. Give this some time in the cellar to show its best. Full, rich, deep and concentrated, there is intensity, purity, freshness and vibrancy that keeps this going from the initial sniff and sip, through to the finish. The wine is made from a Grenache dominated blend with Mourvedre and various assorted allowable grape varieties. Loaded with ripe, spicy, sweet, luscious, rich, red fruits that come with nuances of herbs, lavender and kirsch. The wine is silky, fresh and loaded with red fruits from start to finish. Dark in color, smoke, incense and spice are the first things that greet you. From there you move to the dark cherry side of life. There is a tannic backbone here, due to the reliance of Syrah that means you will need to age this wine for at least a few years, before the freshness and sweet, red fruits are further developed. Made with a blend of 73% Syrah, 18% Grenache and 9% Mourvedre. The wine opens with a touch of smoke before moving to its spicy, red fruit side. Medium bodied, soft, forward and supple, the fruit is ripe, fresh and clean, leaving you with fresh, juicy kirsch and thyme on your palate. The wine is made from a blend of 91% Grenache, 8% Mourvedre and 1% assorted allowable grape varieties. Fresh, peppery, smoky red fruits with a blast of garrigue to make and keep things interesting. Medium bodied, soft and forward, the cherry filled center of fruit is not hard to find. Medium bodied, smooth, lighter, refreshing, style of wine with an elegant, sweet, polished core of fresh cherries in the center that is already delicious to drink. Medium bodied, soft, supple textured and a fresh, ripe, sweet, purity of fruit, which leaves with a good impression. Made from a blend of 85% Grenache and 15% Mourvedre. Medium bodied, soft, forward and flavorful, at the center of this wine you'll find tasty, fresh red cherries with an olive accent. Spicy, smoky, earthy, peppery, dark red fruits make up this solid wine. Made with a blend of 73% Syrah, 18% Grenache and 9% Mourvedre. Better on the garrigue, earth, pepper and red fruit nose than the medium bodied, red berry finish. From a blend of 95% Grenache and 5% Mourvedre, the wine reached 15% alcohol. Earthy dark cherries, polished textures and a spicy, peppery finish. Spicy, soft, open and forward with an array of red and black fruits. This traditional wine has an un-traditional blend as it’s produced with perhaps the highest proportion of Syrah in Chateauneuf du Pape at close to 70% of the blend. Light, polished, spicy, and focused on red cherries with fresh strawberry, this is best enjoyed in its youth. Well past its prime, the wine is tart, overly acidic. Much better on the nose than the palate, there is not much here. Served double blind, I was blown away to find this wine was almost 40 years of age! Still going strong, the lusty, kirsch, pepper and garrigue on the nose was just as strong as the rich, lusty, spicy, ripe fruits and earth in the finish.